When someone in my crochet club brought up the Perovskite Project, an effort to make a giant model of a Perovskite crystal structure using knitting and crochet I knew that I needed to contribute. "Perovskite is one of the most extensively studied substances in solid state chemistry (the study of the chemistry of solids) and is present in large amounts in the Earth’s mantle. 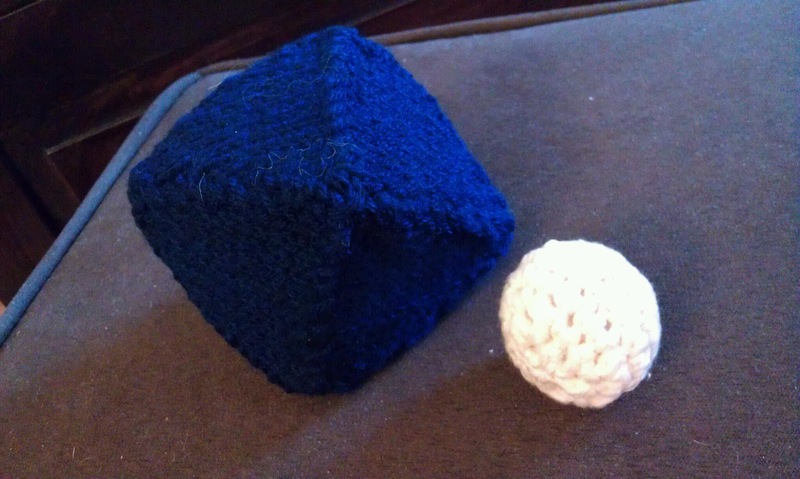 This project is a chance for anyone and everyone with an interest in textile craft, science or both to get together and make something huge!" They are collecting contributions through the end of August 2013 and will finish assembling the crystal model at the beginning of September. This project contains both knit and crochet components, a knit octahedron and a crochet central atom. Crochet project looks like a lot less work than knitting, but I think I will try to contribute at least one of each. 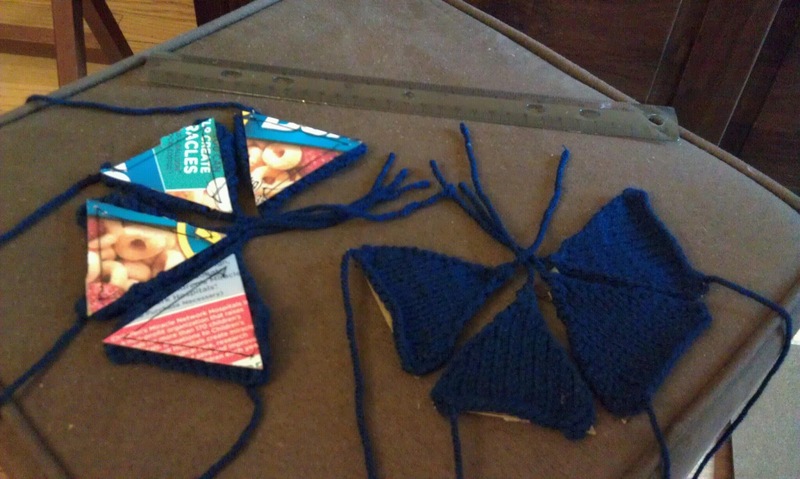 This is a project where the knit creations are a little more unique, but are unfortunately the type of project that I hate (TONS of loose ends to weave in!) However, this is all done in the name of science so I know that for once I will enjoy every minute of weaving in ends and sewing things closed. 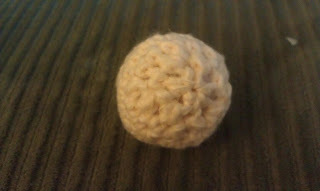 Crochet - Bernat Cottontots Solid in color Sunshine. This is a worsted weight yarn, so I'm following the modifications by Lady'n'Thread with a size E (3.5 mm) crochet hook. 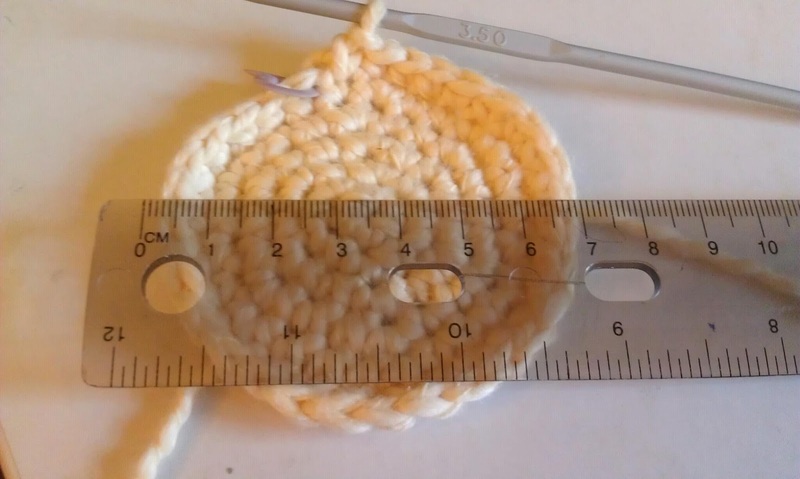 Until reading this blog post, I wasn't aware that English and US crochet instructions were different. Good thing or else my first atom would be a little wonky. Now this first central atom was perfectly 4 cm across, but it still seems a little small to me. 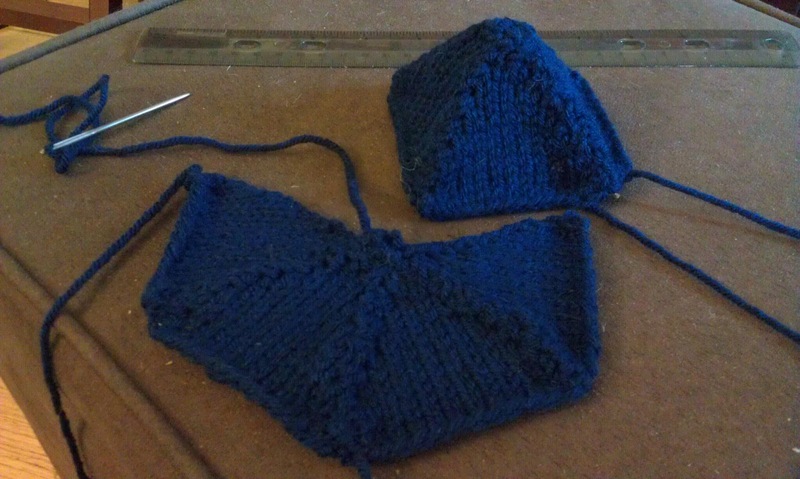 The next one I knit I followed the entire "fewer row" directions. (For the second atom, I increased to 30 sts, did 1 sc round then followed decreases.) 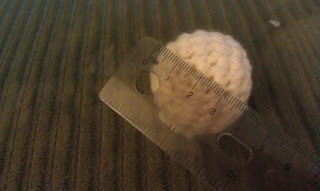 The flat sphere measured 7 cm after round 7, and then I started the decreases. 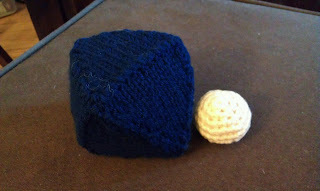 The new central atom is about 5 cm across, but I figured that I'll send them both and let the project creators decide. This time I am following the Lady'n'Thread instructions which differ more greatly from the official ones. I used US size 5 knitting needles because my cast-on with size 4 was a bit too small. I wanted to have the cardboard pieces first to compare them against my knitting. 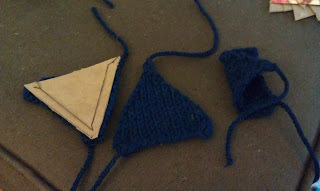 When getting to few stitches at the top of the triangle, I found it helpful to knit backwards to save some time with the turns. My first attempt at drawing a 7 cm equilateral triangle on the back of a Cheerios box was so close that I was able to get a perfect triangle in two attempts! 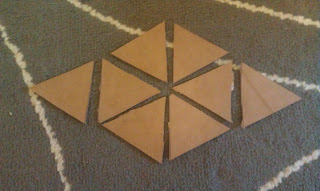 I then used the first one as a template for cutting the rest out with an exacto knife. 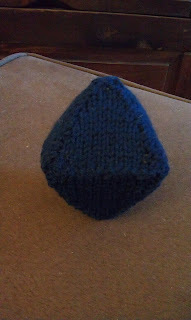 I cut 9 triangles so that I would have one left over in case I wanted to make another octahedron. 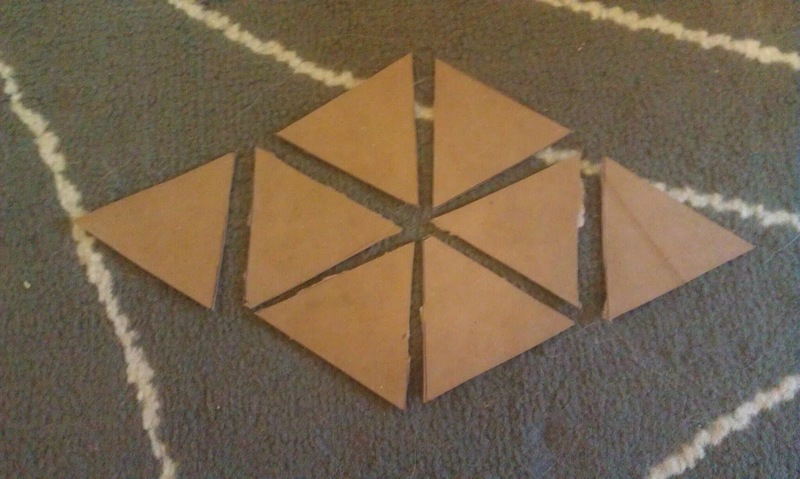 I found it hard to get the needle through the cardboard. I used the exactoknife to poke tiny holes in the card board so I could have something to bring the needle through without ripping anything. I sewed the octrahedron together with the right sides out to create defined ridges along the edge. 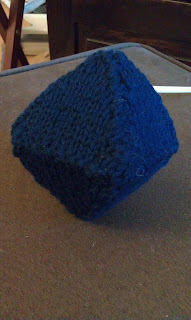 Knitting up the second octahedron went even faster than the first. I ran out of yarn or else I would have been able to create a few more. 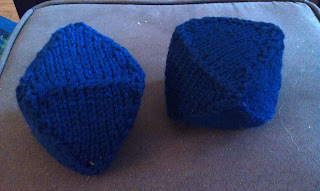 I'm surprised that I did not mind weaving in loose ends or sewing up the octahedrons one bit! Although my first crochet ball is to the dimensions specified by the pattern, it looks small compared to my octahedron when compared to the image of the in-progress crystal shown on the project Facebook page. I decided that for my second ball, I would increase to 30 sts and then crochet 1 round before decreasing and closing it up. The deadline for the Perovskite Project is the end of August, but I wanted to mail the package today so it would arrive in the UK in time. 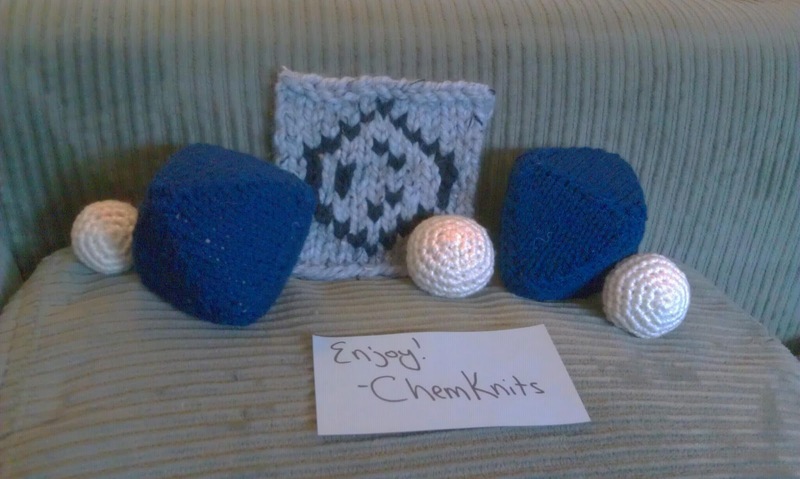 When the said that you could send in a picture for the wall of fame, I knew that I wanted to make sure the they knew ChemKnits was part of the project. I decided to take the following picture that included the pieces I created along with a knit molecule. 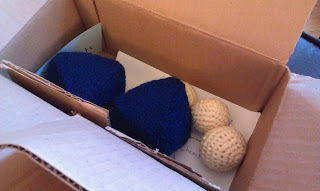 This is the first mass knitting/crochet initiative I've participated in! I had so much fun participating in this project. 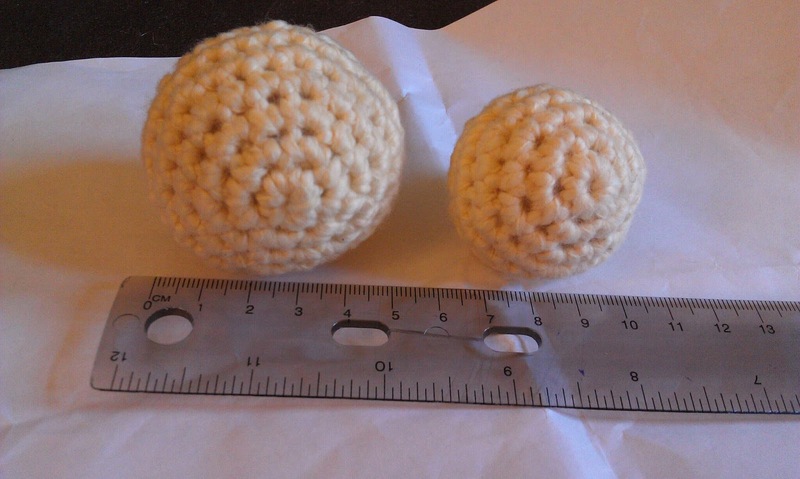 If you know of any collective scientific knitting/crochet projects in the future please let me know. If I'm not able to participate I will at least promote the event! Labels: Just for Fun, Project Archive, Science!